I had a pretty stellar Thanksgiving this year. The party included two of my bestest friends of all time, Rachel and Dave, visiting for the occasion all the way from Austin, Texas (via a year-long stint in Berlin). On the evening before our big day of nut roast and Prosecco, I decided a pre-Thanksgiving dinner detox was in order. So I went with the kind of food that I know I can make well, tastes a bit celebratory, but just happens to be healthy and vegan at the same time. The meal: my reliable red lentil dahl with panch phoran, Indian cabbage salad, basmati rice and flatbread masquerading as naan. This salad is basically a winter riff on this cucumber and coconut salad and leaves a lot of room for improvisation (because I know how much Rachel loves improv). Any cabbage will do for this salad, though I am partial to the texture of Savoy. Chop it chunky or slice it fine. Skip the carrots if you don’t have them, or try adding other slaw-style goodness like bell peppers. Up the spices or the chilli if that’s your thing. Go nuts with the coriander. I don’t usually follow a recipe when I make this, but I’ve attempted to write it up as such all the same. Do let me know if you try it and what you think! I left out the asafoetida and curry leaves when I made this for Rachel and Dave but if you have them, use them. Feel free to chop the cabbage and carrots as finely or as not finely as you have the patience and inclination. My tendency is often to slice as finely as possible, but sometimes I like a chunky salad! 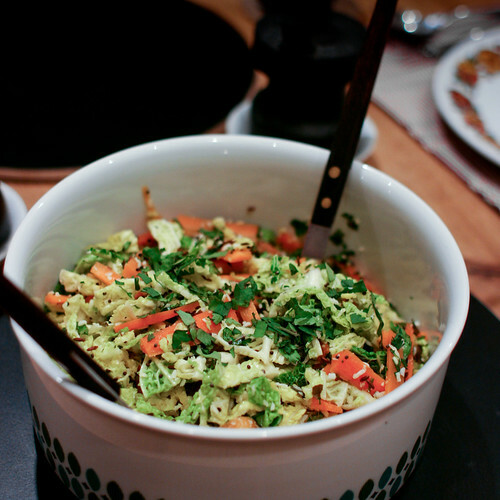 Put the cabbage, carrots and coriander in a bowl and set aside. Put the oil in a large frying pan with the mustard seeds, cumin seeds, asafoetida and curry leaves. Turn the heat up to medium and wait for the seeds to start sizzling and smelling delicious. Add the lemon juice, a pinch of salt and the coconut. Taste, adding more salt, lemon or coconut if desired. Haha, I love that you guys ‘detoxed’ before the big meal 🙂 The salad looks amazing, might be just the thing for the cabbage I bought at market this week! Let me know if you try it – I think it’s right up your alley! And you must definitely try the cucumber coconut salad, too – it’s amazeballs!